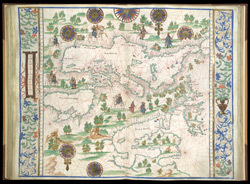 This is a portolan chart from a bound atlas dating from 1542. It shows the British Isles and is the work of Jean Rotz. Invented by mariners, portolan charts take their name from the Italian ‘Portolano’, meaning a written description of Catalan and Italian ports along a coastline. The first Portolan Charts date from the late 13th century and represent an important change in the use of maps and charts. Until this point, most maps had held a religious significance and purpose, such as the medieval mappa mundi which was based on theological beliefs. The portolan chart contrasts with this tradition as they are based on direct observation and first hand experience and have a practical purpose. Reflecting their use by sailors they note only coastal locations, omitting most of the internal detail of the land. Place names are written at right angels to the coast, the more important ports in red ink. The lines which cover this and all other portolan charts are lines of constant bearing known as rhumb lines. These radiate from compass roses and allow the sailor to plot a course from harbour to harbour using dividers and straight edge. Here England and Scotland are shown separated by sea. The south coast is the most accurately presented area. As it typical of a chart from the first half of the sixteenth century the Bay of Cardigan is not shown. The Bay of Cardigan was first accurately depicted in printed form by Gerard Mercator in 1564. Ireland is not shown but rocks are indicated, showing mariners where danger lay. The topography of the land includes trees and clusters of buildings indicating settlements. Travellers on foot and horseback in European dress populate the land.